Pack size: 3 x 120ml solution bottles, 3 x contact lens case & 1 travel zip bag. Recommended for rigid contact lenses, Regard K RGP Contact Lens Solution is the world's first multipurpose solution that is free from preservatives. Manufactured by Advanced EyeCare Research, a UK based company dedicated to improving vision by offering reliable preservative free products; this unique lens solution is an excellent choice to keep your eyes fresh and healthy. The active disinfectant (OxyChloriteTM) in Regard K RGP Contact Lens Solution releases oxygen to your eyes to prevent them from going dry and is extremely good at removing those protein deposits on the lens surface, without enzyme protein removers. It also cleans all the impurities and debris that would be present in gas permeable lenses, without causing any damage to the surface. So you will experience a truly comfortable lens wearing experience, all day long. The absence of preservatives like PHMB that is available in conventional solutions make this product a safe and healthy formula for those with sensitive eyes. Since silicone lenses are now gaining popularity and are highly recommended by opticians, it is essential that you use preservative free solutions to effectively reduce corneal staining. 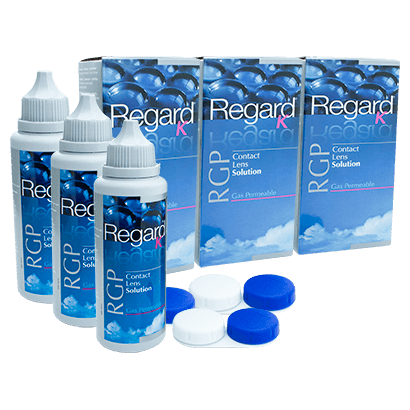 Ideal to use for up to three months, Regard K RGP Contact Lens Solution contains a handy zip bag with three 120ml solution bottles and three special lens cases. So get this eye friendly lens solution and enjoy the complete freedom of wearing contact lenses.